To meet the variegated requirements of our clients, we undertake manufacturing of various Product Stickers using screen printing technique. It is a printing technique that uses a woven mesh to support an ink-blocking stencil. 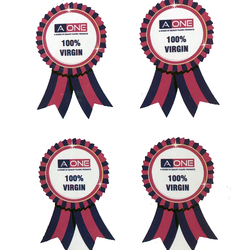 We can offer these stickers in various colors, sizes, shapes and designs as per the requirements of our clients. Screen Printed Stickers withstanding 120 Deg.Temp. These Screen Printed Silver finish stickers with stand to 120 deg. Temperature. This material is special made by 3M. We are the leading supplier and trader of Screen Printing Sticker. With vast industrial experience, we are involved in offering a wide range of Screen Printed Sticker. With extensive knowhow in this domain, we are indulged in providing a supreme quality gamut of Polycarbonate Screen Printed Sticker.